Thanksgiving is a time for food, family gatherings and football. This year we’re going to spend the day with friends, Barb and Dave. Since all our family lives out of town, we’re thankful that we have such good friends. Once everyone is gathered at the table, my husband traditionally asks us to share what we are thankful for. I'm sure many of you do likewise, but from now on, don't make thanksgiving a once a year occasion. I don't mean cook a full turkey dinner more often, but remember to be thankful more often. 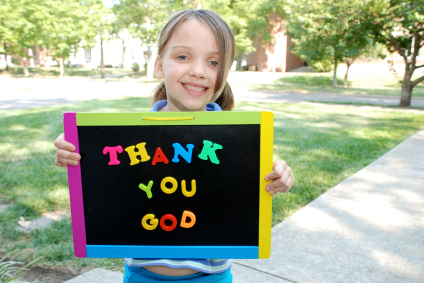 The Bible tells us to "Give thanks in all circumstances for this is God’s will" (1 Thessalonians 5:18). For a long time, I couldn't grasp WHY God would command us to be thankful in everything, even the bad things in our life. As a counselor, I thought that bordered on craziness. What would be different today if instead of complaining or commenting about what wasn’t done at home, you would purpose in your heart to look for something at home you can be thankful for. For example, thank your husband for working hard at his job or thank your wife for making dinner tonight. "Two men looked out prison bars. One saw mud, the other saw stars." Both were present, but which one would you rather focus your attention on, mud or stars? It's not just God's word that encourages us to be thankful. Recent studies in positive psychology confirm that grateful people are happier people, and being thankful for specific things brings us joy. Question: My husband says that he is put into a kind of uncontrollable rage when I disrespect him because it is his God-given right as the husband to be respected. Last night, I told my husband, who has physically struck me in the past, that I felt unsafe in our marriage and that I thought it was necessary that we lay some ground rules and boundaries specifically to be enforced during our times of arguing and fighting so that we can keep each other accountable. He resisted in agreeing that boundaries were the issue, but finally agreed. I told him that a universal boundary should be absolutely no physical striking or threats of physically hurting of any kind towards one another. To that he said that his boundary equivalent to mine was “no disrespecting/raising my voice to him.” He said that when he is disrespected, he feels he is being verbally abused by me, and it feels as terrible as I feel when he slaps me on the arm/leg/head. In theory this sounds “right”. He says that I am making a double standard when I put a boundary on his behavior but that he cannot on me. And yet, something does not seem right at all about what he is saying. I agree that disrespecting your husband is as sinful as physically striking your spouse in anger. Is it biblical to see these as exactly the same in terms of setting “off limits” boundaries in disagreements? Answer: Your struggle to think clearly in this muddle is common to women who live with abusive men. I want to help clarify some important truths. First, your husband’s rage and subsequent acts of violence toward you are not uncontrollable. His behavior is always his choice. I’m sure he has experienced disrespect from other people in his life--his employer, a rude driver, your children, a friend, an enemy. People sin against us all the time in many ways and sometimes we do get angry. However, that doesn’t mean we hit them. In fact, isn’t that what we teach our children NOT to do when someone takes their toy or makes them mad? We don’t hit people when we’re mad. Period! Let me ask you a question. Does your husband hit other people in the arm/leg/head when he feels disrespected? What do you imagine a police officer would say if your husband used that as his excuse when he hit someone who disrespected him in traffic or at the mall? Hear this important truth. Your husband hits you when he is mad because he chooses to and you have continued to enable him by not enforcing legal consequences that would protect you from this kind of abusive behavior. He says that it is his god-given right to be respected. It’s also your god given right to be loved and cherished. When he fails to love and cherish you and you feel hurt or angry, do you hit him? The second truth I want you be crystal clear on is that you will fail your spouse and he will fail you. Sometimes these failures are big but often they occur in little ways. He doesn’t love me like I’d like or she doesn’t respect me like I want her to. The truth is, our spouse doesn’t always give us what we want even if what we want is a good and godly thing. Hurt and disappointment occur in every marriage and we can feel angry. But is the right answer to treat our spouse with abusive behavior or abusive speech when they don’t give us what we want? Jesus says “never!” The Bible labels that kind of behavior sin and selfishness and is never justified. The truth is no one gets everything he or she wants all of the time. Part of growing up and maturing is learning how to handle ourselves in a godly, mature way when we are disappointed, angry and hurt when we don’t get what we want. Purchase the complete recording of the "Does God Want Me to Be Happy" Webinar at 50% off! Win $50 in free merchandise from our website--just in time for holiday shopping! Plus see winners of previous give away! As a special Thanksgiving offer, you can purchase the complete recording of Leslie's Webinar "Does God Want Me to Be Happy?" at 50% off the retail price. This MP3 file retails for $59.95, but can be purchased through midnight Sunday, November 25th for just $29.95! You should have already received the introductory recording for the webinar when you registered to receive my newsletter at my new website. However, now you have the opportunity to own the complete recording of all four sessions so that you can start implementing the practices necessary to lead a happier and more fulfilled life. I want to help you get a jump on your Christmas shopping! So this newsletter, one lucky winner will get to select $50 in products from my store. You can select items to give as gifts or perhaps there's something you've been wanting for yourself. 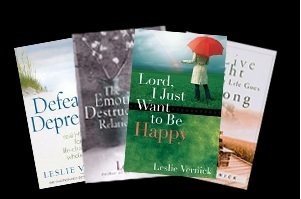 Go to www.leslievernick.com to view a complete list of items available in our store. Free shipping will be included. Just email your name to assistant@leslievernick.com by midnight Friday, November 23rd for a chance to win $50 in Leslie Vernick merchandise. Congratulations to Sylvia T. of Sumter, NC, and Mary Beth R. of Muskegon, WI, winners of Idol Lies by Dee Brestin. circumstances and relationships in a way that people could understand and relate to.